Ambition is definitely a two edged sword. When I was a manager, I always looked for ambition in my direct reports. I wanted to see a thirst for knowledge and a desire for increased responsibility. But, I also looked for the ability to self manage ambition and a recognition that proven skills are the pathway to career success. This balancing act is hard to master and I saw it only in few outstanding performers. More often than not, less than outstanding performers wanted advancement based on potential rather than contribution. Like Icarus in Greek mythology. these reports flew high only to have their wings melt and careers end. So, if you have an overly ambitious direct report what kind of advice can you offer him/her? Perform your job to the best of your ability. Outstanding performance is the quickest way to get noticed by Management. Seek ways to strengthen or expand your current job. Bring something different to your role that helps the Organization deliver better results. Learn all you can from the job and your associates. Many people simply focus on completing tasks when each project offers an opportunity to interact with people who have knowledge that can help you perform at a higher level. Proactively enrage these people. Learn from them. Incorporate their expertise into your skill set. Ask for and apply feedback from your manager to improve performance and your value to the company. Shine a light on your opportunities for improvement. The only way for you to meet expectations is to understand where your skills may not be sufficiently developed to be considered for the next level. Understand what the criteria for advancement to the next level is. Every promotion is a competition with other qualified candidates (inside and outside the Organization). You need to know what the criteria are to handle the next level and have an idea what the competition looks like. You may feel qualified for promotion, but are you the most qualified person available? Make certain you and your manager are aligned on both your short and long-term professional goals. There is nothing worse than realizing you are on the wrong career path to achieve your dream. If you find a misalignment, your manager will be your strongest advocate to either change your projects or change your career path to ensure congruence. Take on special projects and solve challenging problems to enhance your business acumen and demonstrate your skill mastery. These are opportunities for visibility and to learn at a faster rate. They enhance your job rather than distract you from it. Don’t be too impatient. You have to learn your current job and contribute something meaningful before taking the next step forward in your career. Too many people get promoted before they are ready only to fail at the next level because their skill set has not had adequate time to develop. I can remember a conversation I had with a direct report. I asked him what his career goal was. He replied “I want to be CEO”. I told him that dream could happen today for $100. At first he was excited and wanted to know how. I explained registering an LLC cost roughly $50 and buying business cards would also be about $50. He thought for a minute and said “But what would I do? I have no business plan and don’t know how I’d make money.” I said, “Exactly. That is why having a position as a career goal is so dangerous. Now, let’s talk about the skills you would like to develop and set mastery of those as your career goal instead.”. I have found that changing the paradigm of ambitious people to focus on skill and knowledge mastery is the best way to harness their energy and position them for maximum career success. 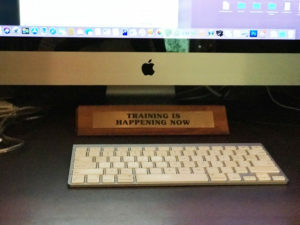 It is also why on my desk I had a sign that read “Training is Happening Now” to let my reports know that every interaction is a potential teaching moment aimed at helping to ensure success in their career. And in every interaction I had with direct reports we would end the meeting by discussing what was learned. Creating a mindset of “I am here to learn” among your reports is the best way to prepare them for the next level. If you are a person who loves to invest and would like to calculate the future value of a car or similar vehicle you can use car depreciation calculator. If you want to learn more about personal branding visit this link. Question from a millennial who is ambitious and still learning… also leading direct reports. What is an appropriate time for one to move on to a new career, engage in a role within the same company, or engage your reports to be ambitious when they can reach higher and you’ve given all opportunities available. Or if it’s me, I’ve reach my potential, gone above and beyond and there may not be a path to present or a skill set left to engage. I see some who jump every year which I cringe. But generations have different perspectives and I know how much time you invest in new hires. 2 years 3 years? What’s your take? Katie – Great question. As you might expect, the answer depends on a number of different factors based on the specific industry. But, as a hiring manager here are my thoughts. For non-management roles I always felt a person needed at least 18-months in position to show proven performance. It usually takes about that amount of time to identify a problem, envision a solution, mobilize organizational resources against a course of action, act, and then measure results. I was always interested in what could be attributed directly to the candidate as evidence of skill mastery. For managerial positions, the timeframe is longer because I would look not only for evidence of problem solving skills, but also evidence of both leadership and development of others. The later typically takes longer than 18-months to demonstrate. With respect to your thought about maxing out on your current career path, I can totally identify with your feeling. I started my career in a technical field and felt as you do. While not always the right solution, I decided to switch fields. I focused on building the base skills I felt were needed to move to a branding career path and actually took a step backwards (pay and level wise) to make the jump. It was the right decision for me and it rekindled my enthusiasm and professional growth. As a closing thought, be careful not to jump too early because it can appear to a hiring manager that you may be a continuity risk. If you do decide to jump early be certain you are able to articulate why. It helps to be in a position to explain the skill you wanted to develop and did, and the accomplishments you had in the short period of time. If you can do neither, it is a cause to pause.